What a whirlwind! It’s been a little over a week since I got home from the conference. By now I’m sure you’ve read quite a few polished, professional posts on the conference. If you’re looking for the technical, don’t bother reading any further, as my story is one similar to the magic that is experienced during a child’s first trip to Disney (appropriate since //build/ was in Anaheim, next to Disneyland). I have the advantage of speaking only for myself (not for a company), and I wanted to share my personal experience. I decided to break this into parts because I’m afraid it won’t get published for months if I try to finish the entire thing before sharing any of it. Reason: Upon my return from the conference, we placed a bid on a house. Our already-busy lives will now be turned upside-down with packing & moving, so my blogging bandwidth will be up in the air for the next few months. In part 1, I’ll talk about the days leading up to day 1 (and what enabled me to attend) the conference. As a working mother of 2 small children (now 5 & 8) whose employer does not send programmers to big conferences, a conference over a few hundred dollars is not really an option. The early bird ticket was less than $200. I used AA frequent flyer miles to get there. I shared a room with a friend (split the cost). I only had to leave my family for 3 days. 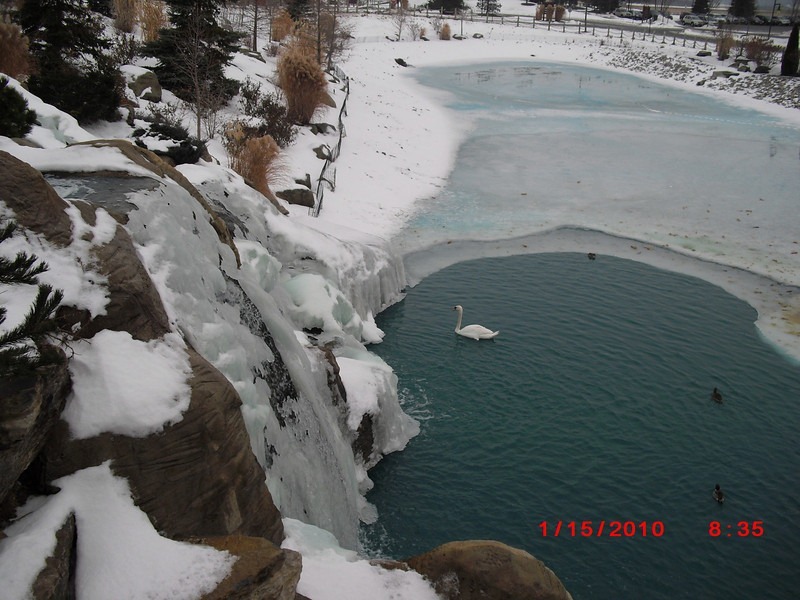 Sessions at CodeMash include a variety of programming languages (Java, .NET, Ruby, Python, etc.) on a huge range of topics, and it’s a great place to take the whole family. Even though it’s in January in Ohio, the entire conference is encapsulated inside the Kalahari Resort, which has an indoor waterpark with an indoor surfing machine. 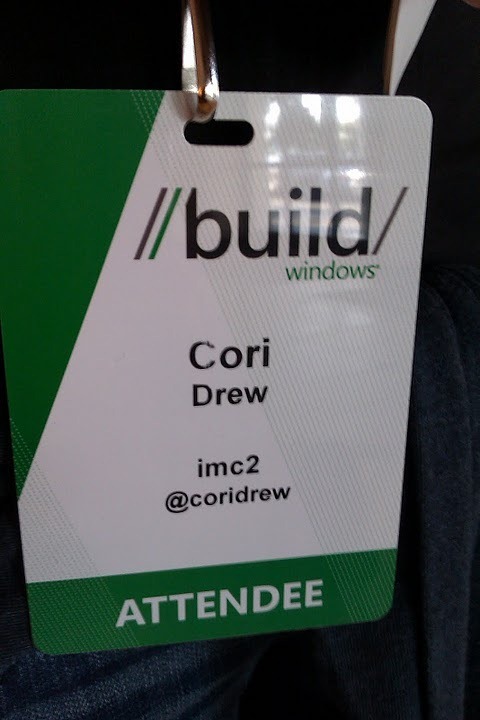 That doesn’t mean I didn’t dream of going to a huge Microsoft developer conference some day (in fact, I went through the signup process multiple times when I saw early bird discounts being announced, stopping at the “pay now” screen). The first week in August (less than 6 weeks before the conference), I saw a tweet that linked to this contest by @StartupWeekend & sent them a few entries on a whim. I knew that @HackerChick (Abby Fichtner) had been doing a lot of work with startups since I met her at CodeMash. I had the privilege of meeting her for lunch one day during //build/, and when I told her that their contest was what enabled me to attend, she LIT UP with excitement. Abby raved about how much she absolutely loves the people who run Startup Weekend, and said their weekends (“54-hour events where developers, designers, marketers, product managers & startup enthusiasts come together to share ideas, form teams, build products, and launch startups”) are events not to miss when one happens in your area. Although I had booked a 6pm flight on the 12th, early arrival at DFW enabled me to catch a plane with an 11:10 departure. My flight landed at 12:30 at SNA (about 12 miles from the conference), and I’ve never experienced a more streamlined airport arrival. I got my luggage & rental car, and was actually seated watching “The Rev” by 1:15. Sitting next to him in the back row, I met Jim Galasyn (blog), the first of a long list of really great people I had the fortune of meeting at //build/. When precon ended, I checked into my hotel. I then walked to the conference registration hall, where I was STOKED to run into Brandon Satrom & Clark Sell, Microsoft DE’s & Developer Smackdown podcasters. They’re so awesome. I simply HAVE TO mention how priceless it was to have Twitter ID’s printed on the conference badges. That seriously rocked. In fact, I met @ShiftKey (from Sydney, Australia! ), whom I’ve been following on Twitter for a while, at BUILD because I recognized his Twitter ID while in John Papa’s session. After chatting for a while with Clark & Brandon for a while, I headed to the Hilton Lobby, where the Twitter #bldWin buzz was, to try to find someone I knew (after all, I HAD met, what, 5 out of the 8,000 people at the conference? haha). Boy was that an uncomfortable, awful experience. The lobby was FULL of people wearing conference lanyards. I must have circled 11 times. I recognized 1 person (Shawn Wildermuth), but had never met him before & was too shy to introduce myself, so I went back to my hotel & ate alone in the hotel restaurant. Keith took me under this wing during //build/, and I couldn’t be more grateful. I’ve been a big fan of Deep Fried Bytes for years. I had the fortune of meeting him at CodeMash & telling him how much I love the show. We’ve interacted on Twitter since then, and he read in my blog what a big deal it was for me to get the nerve up to go to Austin WebCamp alone (isn’t that crazy?). Through the once again life-changing magic that is Twitter, Keith saw that I was attending //build/ and invited me to their Deep Fried Bytes dinner at 8pm that Monday night. I went a tad fanboy when Keith introduced one of the last to get there as he sat down across the table from me. In case you haven’t noticed, I’m not really good at suppressing my appreciation / respect / enthusiasm for those I’ve learned from via podcasts on my jogs. I understand there is a LOT of written information out there, but often the only time I have in my day of complete solace & concentration, where I can focus on nothing but learning something that expands my mind beyond what I’m programming for work, is in that 30 to 60 minute alone-time window I might get a few times a week. Words cannot describe how interesting that dinner was. To be around the very people who wrote the code & the frameworks I love so much was incredible. To have the opportunity to have such interesting (not to mention fun) talks with so many Microsoft MVPs was inspiring. Let’s put this in perspective. 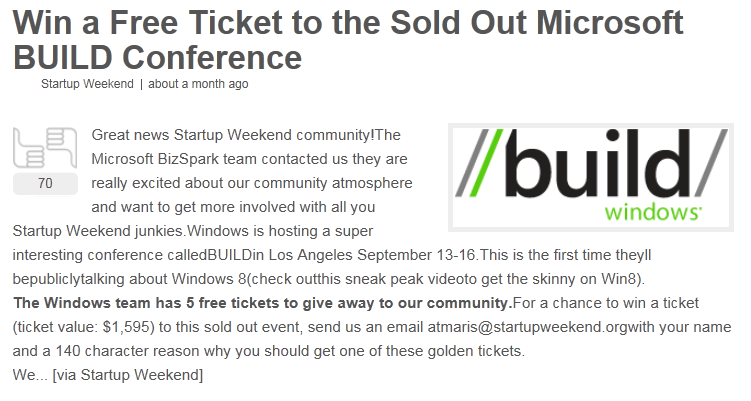 The content announced at the BUILD Conference was information very few were privy to. Many of those traditionally on the inside, both working & not working for Microsoft, had no idea beyond press hearsay & a Windows 8 preview video or two, what was going to be announced. At the Monday night dinner (the night before the conference started), Harry Pierson & Glenn Block were… I can’t find the right word to describe it… glowing; beaming; excited… a combination of all? Both Harry and Glenn were speaking at the conference (I linked to Harry’s talk above. Here’s a link to Glenn’s session), which meant they both had information everyone else at the dinner wanted to know. I couldn’t believe how great this group of people was. I was just some outsider they’ve never met, and I felt more comfortable within 5 minutes than I often do [in non-tech company] after knowing people for years. These people never sleep. I live in the Central time zone. A dinner that starts at 8pm Pacific time is already past my bedtime. That’s my 10pm… when it starts! I had flown in that day (got up at 5am CST). By the time I got back to my hotel from dinner, it was around midnight, which is my 2am (as seen by this post-dinner Tweet that shows my quest to research dinner discussions overrides my common sense to tell me to get sleep). What a first day… and the conference hadn’t even started! Just got around to reading this, great post. 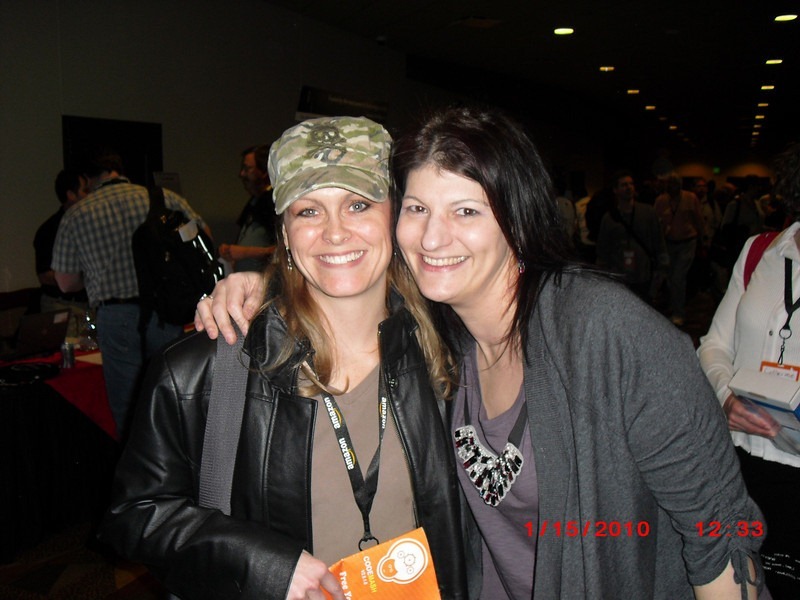 It was awesome to meet you and hang out at Build and then at Codemash. Thank, Glenn. It was SO great to meet you, too!